Georgia – In 2018, one of the most popular Dutch television shows ‘WIDM’ was shot in Georgia (the country, not the state), which resulted in a rise of Dutch travelers to Georgia. Although I never watched WIDM, I can imagine it was easy to convince the Dutch audience with footage of Georgia’s majestic mountains, lush vineyards, unique cuisine, vibrant Tbilisi, and ancient cave cities. Last spring, I solo backpacked in Georgia for about two weeks. Most of my time I spent hiking the Caucasus in Georgia’s north. Here’s a mini guide to backpacking Georgia with my itinerary, highlights and tips! The semi desert plains around Davit Gareja on the border with Azerbaijan. Davit Gareja was one of the highlights of my visit to Georgia. – Backpacking Georgia. Copyright Bunch of Backpackers. 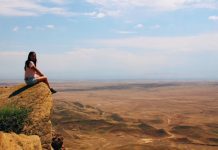 Why should you go backpacking in Georgia? How to prepare for backpacking Georgia? Is it safe to travel to Georgia? What to eat and drink in Georgia? Compact and diverse. You can easily spent 5 to 6 weeks in Georgia, but it’s also perfect for a one-week holiday since you can easily do beautiful day trips from Tbilisi. The landscapes vary from desert and mountains to sea and forest. Affordable. I only spent 30 euro’s per day (find my detailed overview of costs of backpacking in Georgia here). 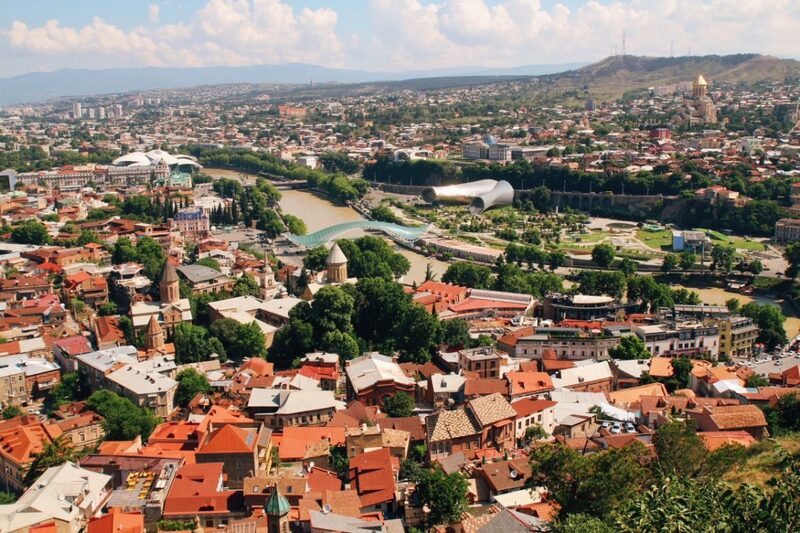 Flights to Kutaisi and Tbilisi are cheap from Europe. Rich culture and history as the crossroad between Europe and Asia. It’s the land of wine! Georgia is the oldest wine-making country in the world. The famous Stephantsminda church near Kazbegi. 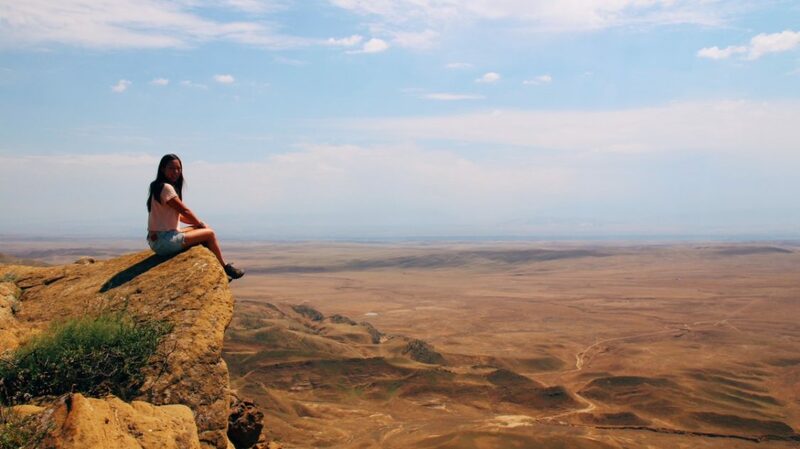 It only takes a 1,5 hour hike up to reach this beautiful view. – Backpacking Georgia. Copyright Bunch of Backpackers. Obviously, I only had a limited amount of time. 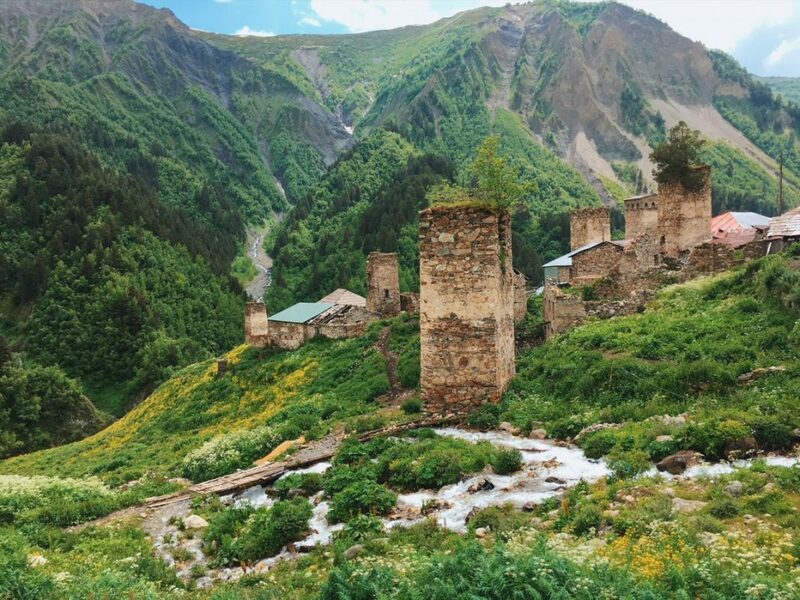 These are some places I didn’t go to, but would love to visit during a next backpacking trip in Georgia: Tusheti (! ), Vardzia cave city, Stalin museum in Gori, and Batumi. Funky Kuro camping in Kazbegi with bonfires and hammocks. – Backpacking Georgia. Copyright Bunch of Backpackers. Highlights: Visiting the beautiful Bagrati cathedral up on Ukimerioni Hill, the extravagant Colchis fountain with golden ornaments and vibrant Kutaisi market. Also, I did a fun full-day tour from Kutaisi, which included a visit to Okatse canyon, Martvili canyon, Kinchka waterfall and a trip by old Sovjet style cable car to Gelati monastery. The day tour was quite touristy, but still much fun! Highlights: The cable car for a beautiful view over Mestia. A visit to the Svaneti History & Ethnography Museum, lunch at the Sunset cafe or drinks with live music at Leila’s. However, the main thing to do in Mestia is hiking. I did a five day Mazeri to Usghuli hike together with a fellow traveler (without a guide). However, there are also plenty of day hikes possible e.g. the hike to Chalaadi glacier or to the cross. 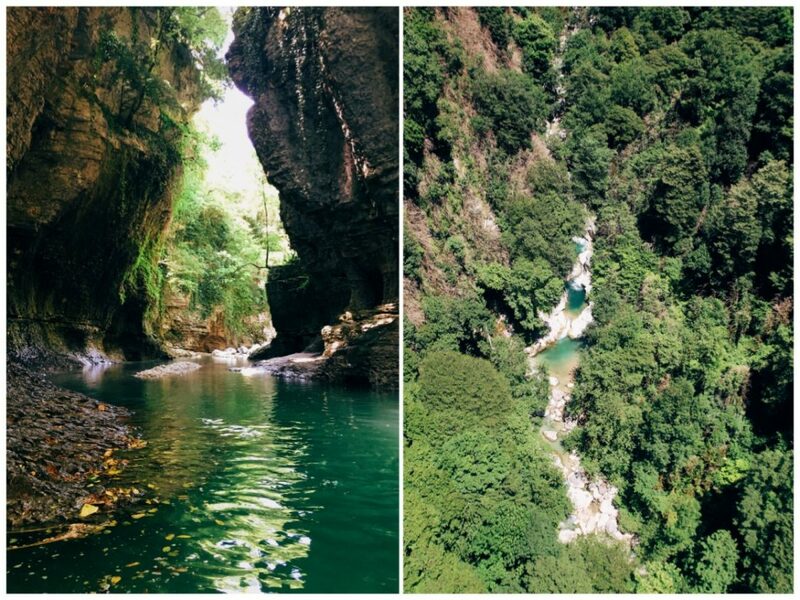 A fun day trip to Okatse canyon and Martvili canyon from Kutaisi. In Martvili canyon, you can do a touristy, but beautiful 25-minute kayak ride – Backpacking Georgia. Copyright Bunch of Backpackers. Highlights: The Old Town with the meidan (bazaar), the avant-garde Peace Bridge, the Clock tower, Narikala Fortress, the cable car, and Rike park. In Georgia’s city centre, the Museum of Georgia is worth a visit. In the evening, there are plenty of good restaurants or you can go clubbing in the epic Bassiani techno club. When I was there, a friend of mine performed at the huge Tbilisi Open Air music festival, which was also fun to attend. If you’re looking for a cocktail or classy drinks, I heard Dive Bar is the place to go. From Tbilisi, it is also easy to do day trips to the cave monasteries of David Gareja (highly recommended), to the winefields in Sighnaghi or to the Stalin Museum in Gori (unfortunately, I did not have time for Gori). 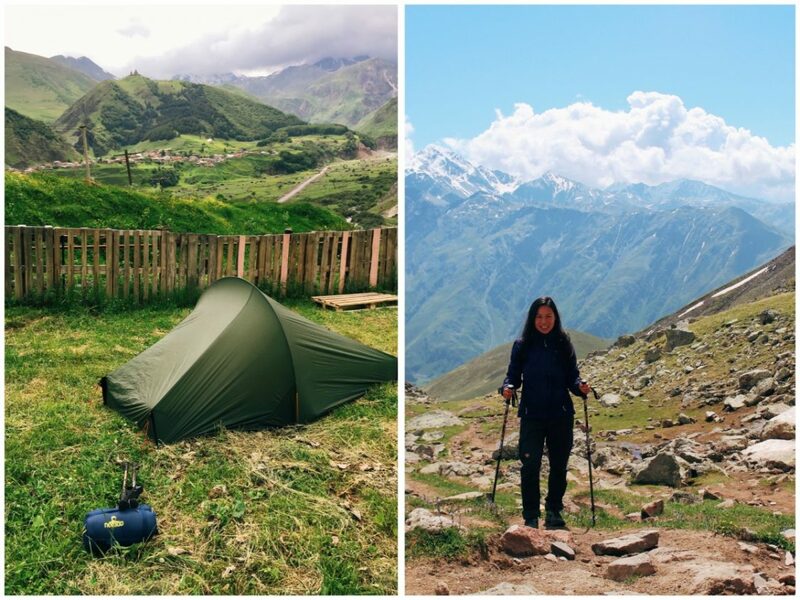 Camping in Kazbegi and hiking to Gergeti glacier. Make sure to get up early for the Gergeti glacier. – Backpacking Georgia. Copyright Bunch of Backpackers. If you only have one week in Georgia, I would suggest the following one-week Georgia travel itinerary. Start off with one full day in Tbilisi before taking the bus to Kazbegi. 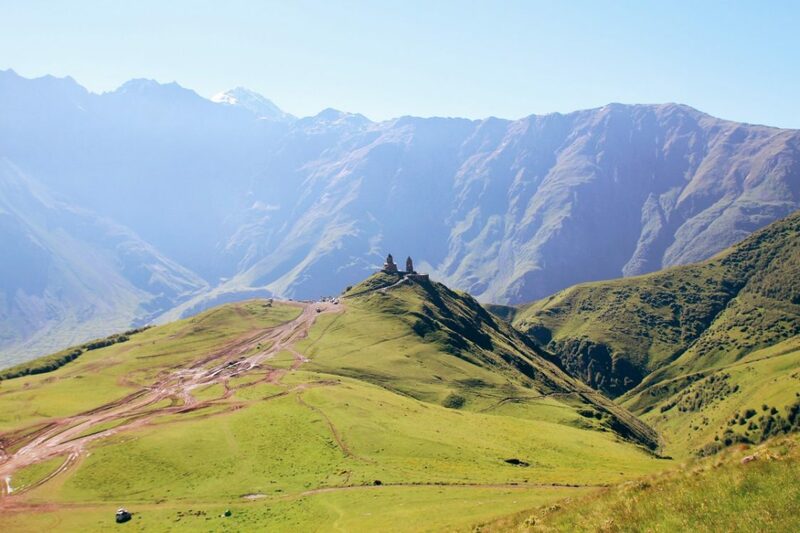 If you love hiking, stay for one or two nights and explore the majestic Caucasus mountains. If you don’t love mountains and hiking, a day trip may suffice. Then head back to Tbilisi. From Tbilisi, you can do easy day trips to David Gareja, the cave monasteries, to Stalin’s Gori and to Sighnaghi. If you love wine (and relaxing), I would advice to stay at least one night in Sighnaghi. Backpacking in Georgia is easy and safe, but you may want to pack and check some things before you go. If you go hiking and trekking: bring good hiking shoes, trekking poles, a rain cover, a rain jacket and a poncho. If you also plan to go camping: bring a tent, sleeping bag, sleeping mat, a water filter, thermal clothing, a cap, sunnies, and a power bank. 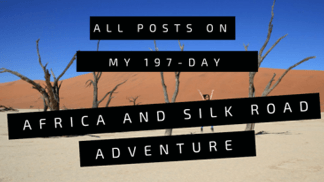 Please find my full packing list for backpacking trips here. Download the maps.me application. The Georgia map has useful information. Tbilisi, Georgia’s fun and vibrant capital. Copyright Bunch of Backpackers. The best to visit Georgia is between June and September. This is also the best time for trekking. The winter months are great for ski trips. Like always, I kept track of my expenses on paper. In Georgia, I spent roughly 27 euro or 31,5 USD’s per day. I mostly slept in dormitories in hostels or in my tent and ate at small local places, which kept my Georgia backpacking costs low. Most dormitories in Tbilisi are about 8-9 euro per night. A single budget room outside of the capital city is about 10-11 euro per night. These prices often include a simple breakfast. Food is between 4-8 euro per meal. Traveling in Georgia is generally considered safe. The political situation is quite stable, although protests may occur. The Foreign and Commonwealth Office (FCO) advise against travel to South Ossetia and Abkhazia. Check out the UK Department of Foreign Affairs for the latest information. 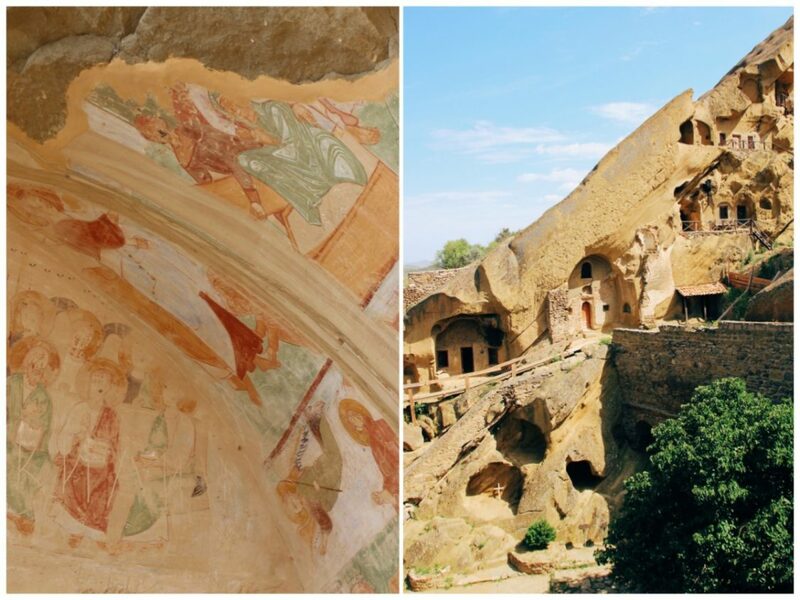 Beautiful Udabno monastery at Davit Gareja with ancient frescoes painted in the 10th to 12th centuries. Don’t underestimate the path leading to the monastery. It’s actually quite steep, slippery and narrow. I strongly recommend to wear proper hiking shoes! – Backpacking Georgia. Copyright Bunch of Backpackers. 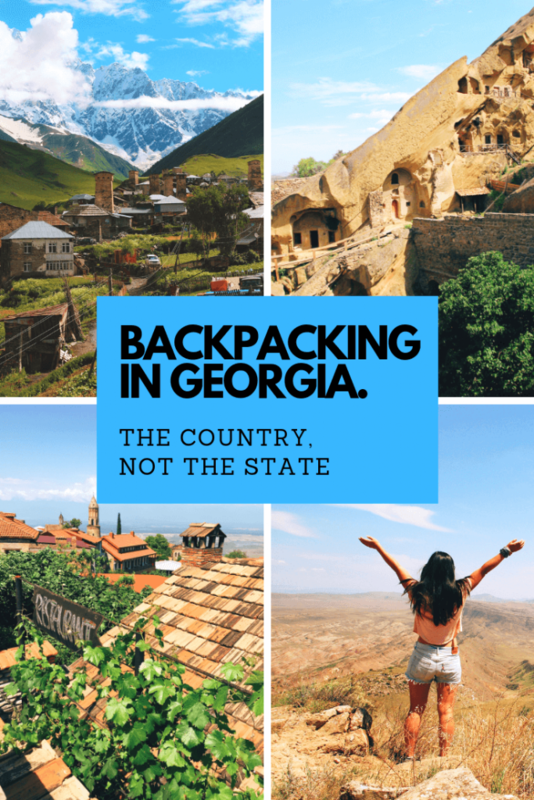 As a ‘solo female traveler’ in Georgia, I haven’t felt unsafe while backpacking in Georgia (although I was only there for a brief time). 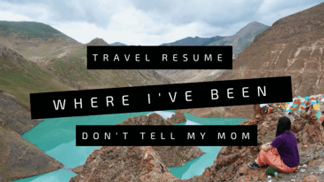 I also haven’t heard any stories about sexual harassment from other female travelers. Tbilisi has many fun hostels, which are a great place to meet other solo travelers. Tours are also a good way to meet fellow travelers, such as the David Gareja tour. 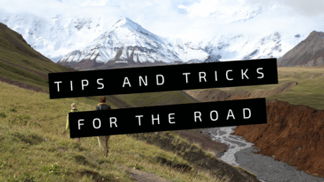 In places like Kazbegi and Mestia, I only encountered a few other solo travelers. The main language is Georgian, but I found some people also speak English (especially in the tourist areas)! In Svaneti, the Svan language is spoken. I usually buy a sim card directly upon arrival. In Georgia, I used Beeline Telecom. I had decent 3G almost everywhere. Colorful Camping at Kuro in Kazbegi. – Backpacking Georgia. Copyright Bunch of Backpackers. 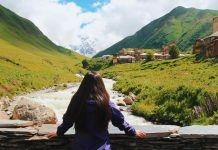 With exception of Tbilisi, you won’t find many ‘typical’ hostels in Georgia. However, there are many cosy guesthouses and cool camping places. In the mountains, you can go wild camping. Here is a list of the places I stayed. Kutaisi – Hostel Vagabonde. Lovely hostel with friendly staff and a terrace overlooking the river. It’s a good place to meet other travelers. Mestia – Nino Ratiani Guesthouse. A highly popular guesthouse ran by the lovely and hospitable Nino. 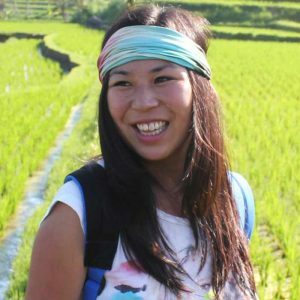 The type of traveler differs from young backpackers to couples and families. Tbilisi – Marco Polo hostel. 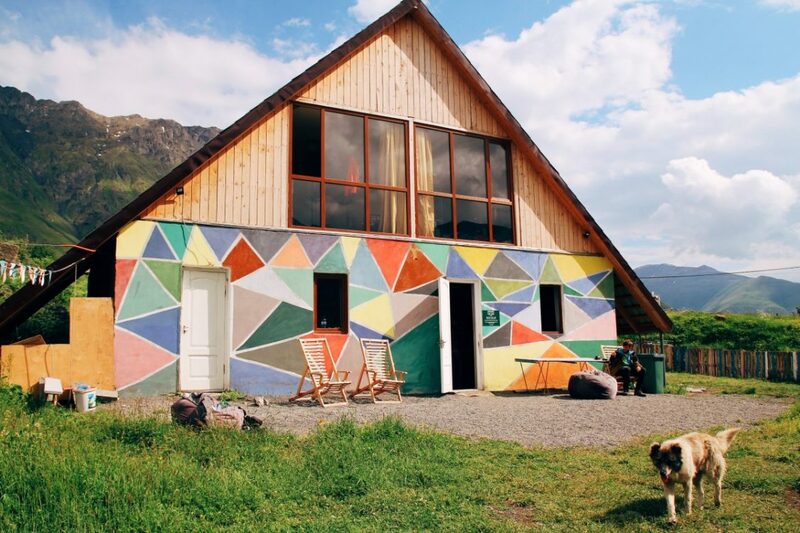 A great hostel right in the middle of Tbilisi. Because it small and homely, it’s a great place to meet other travelers. 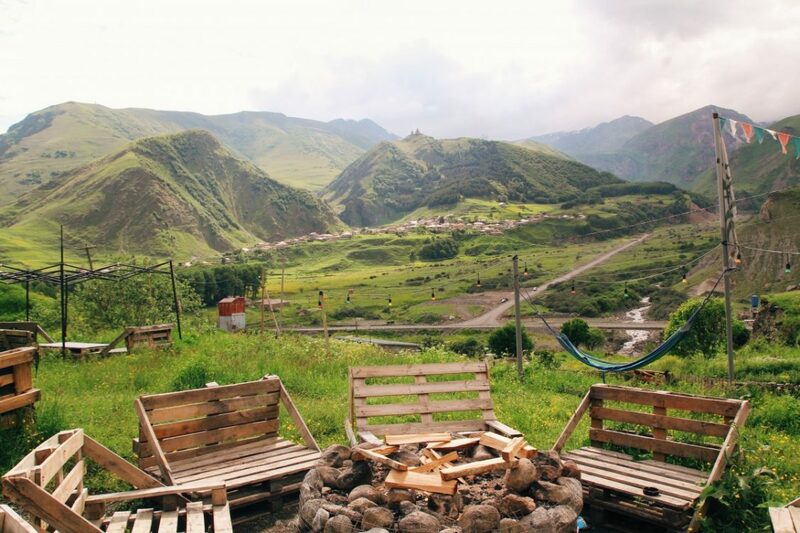 Kazbegi – Kuro camping and hostel. I camped at Kuro and had a beautiful view of Stephantsminda. It’s a funky place with hammocks and bonfires. Georgian food is quite heavy on the stomach, but very delicious (especially if you love cheese and wine)! -Backpacking Georgia. Copyright Bunch of Backpackers. My friend Tyler lived in Tbilisi and knows it very well. These are some of his restaurant recommendations. Racha: Heavy food, their ojakhuri is especially nice. Gets busy, because so many foreigners learned about it, but otherwise it is a classic haunt. Taglauri: For excellent khinkali, they make Tusheti style khinkali too. 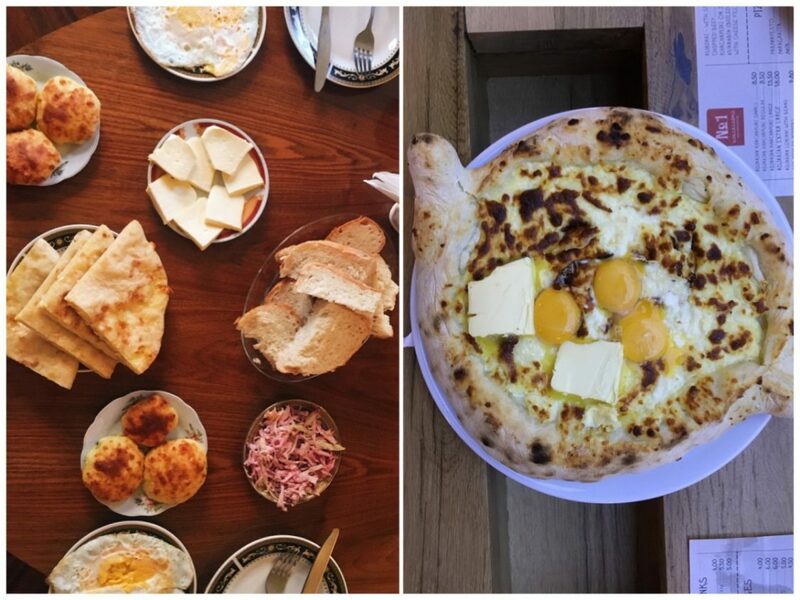 Retro Cafe: For khachapuri. It’s really good and you can order the deadly deadly Titanic khachapuri. It’s huge. Gvimra: For something a little “fancier”. Chef is really creative, friends opened it together. Modern take on Georgian food with ingredients you rarely see anywhere else. Amra: Pretty far out of the city center, but they make great Abkhazian and Mingrelian food. 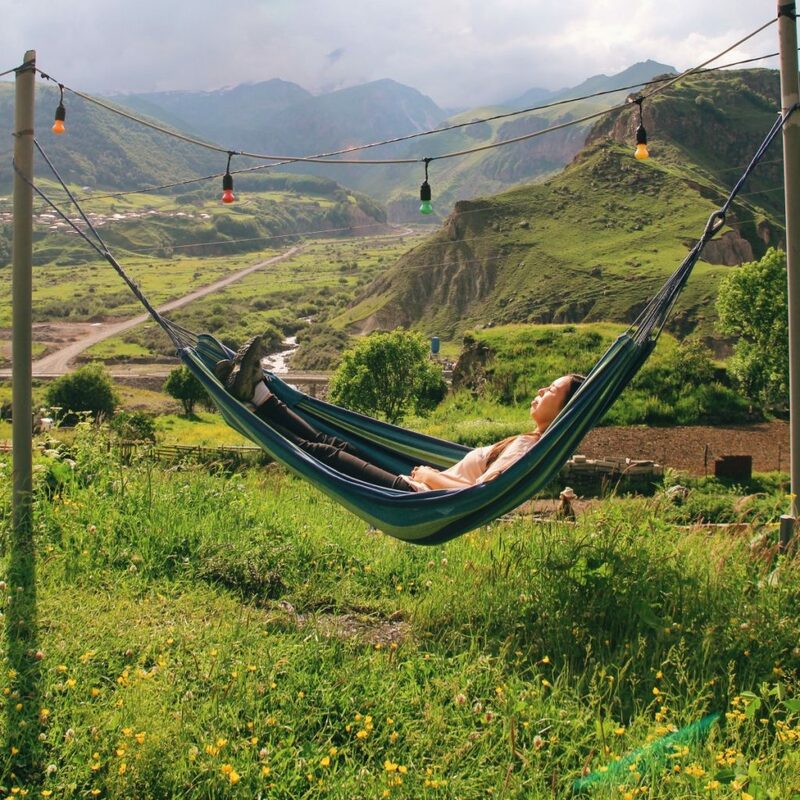 The best hammock in the world at Camping at Kuro in Kazbegi. Will you be relaxing in this exact same spot soon ;)? How much does it cost to travel in Georgia? I’m a vegetarian, and can easily say that Georgian cuisine is one of Top 5 Favorites on the entire planet! Omigosh! I think Georgia might now be on my short list of places I need to visit! Thank you for all the great information!